The $45 million program, funded by the Defense Advanced Research Projects Agency, aims to create an army of “insect allies” that could be deployed in agricultural emergencies to infect crops like wheat or corn with genetically engineered viruses that could make them drought-resistant, frost-resistant or disease-resistant. 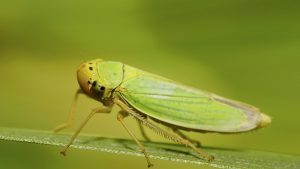 DARPA is currently studying three insects to carry out its goals — aphids, leafhoppers and whiteflies, which naturally spread viruses among plants. Recent advances in gene editing could allow researchers to customize viruses that could switch on or off certain genes that, for example, control a plant’s growth rate, which could be useful during an unexpected, severe drought, the Washington Post reports. The agency describes the research as a way to improve food security. But an international team of scientists and lawyers warn the technology could be put to more nefarious purposes, including military applications, The Guardian reports. “It is our opinion that the knowledge to be gained from this program appears very limited in its capacity to enhance US agriculture or respond to natural emergencies,” write the authors of a paper published in the journal Science on Friday. If true, the program would violate the nternational Biological Weapons Treaty, argue the authors of the article, who include Guy Reeves, a biologist at the Max Planck Institute for Evolutionary Biology in Spain, and Silja Voeneky, co-director of the Institute for Public Law at the University of Freiburg in Germany. In order to respond to an agricultural emergency, officials would somehow have to find a way to distribute living, infected insects to farmers around the country, which to the concerned scientists sounds like a very bad idea. Researchers in the program are required to include three separate “kill switches” to shut down their technology, in addition to using biosecure greenhouses for the demonstrations. “DARPA is producing neither biological weapons nor the means for their delivery,” DARPA’s program manager for Insect Allies, Blake Bextine, told the Washington Post. The concerned scientists argue that the mere announcement of the Insect Allies program, regardless of its true motives, could spur other countries to create similar technologies capable of being used as biological weapons. “Indeed, it may already have done so,” they write. Is there anything we can do anything about this? Man’s arrogance will be our downfall.Gene mutations in the gmo insects creating unique and unstoppable diseases that could have the capacity to be zoonotic.Lovely.